The Adventure Rock, situated in Conference Center Plaza, is one of the free summer activities in Mountain Village Center. For those looking to test their strength, this man-made boulder offers various problems for the novice to expert climber. Adventure Rock is open for the summer season! Please follow these basic rules for your health and safety. Bouldering is a personal choice and requires personal responsibility as well as adequate skills, training and conditioning. 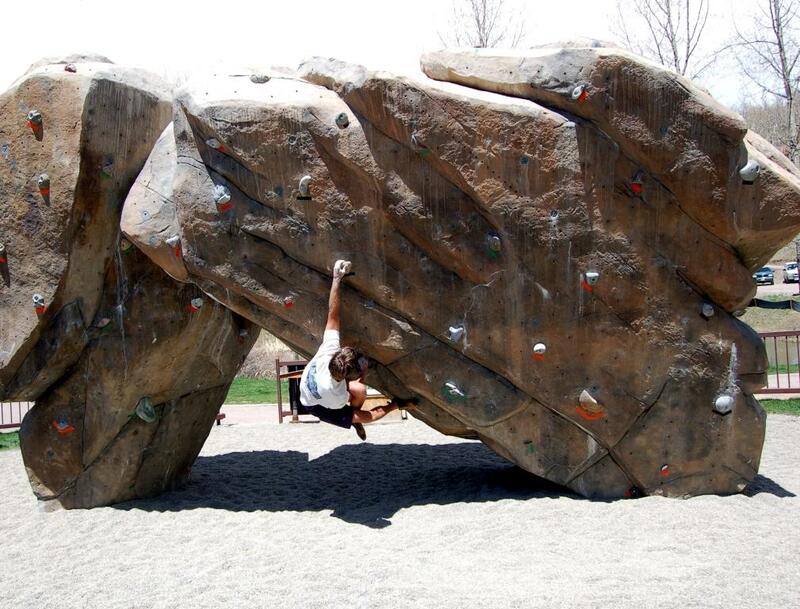 Bouldering and associated activities are dangerous and can result in injury and/or death. Risks are not eliminated by training or skill. Bouldering in pairs and spotting each other at all times is strongly recommended. Never climb above or below another person bouldering. Children must not use the facility without continuous parental supervision. Always warm up and stretch before you start climbing. Find rest opportunities to help extend your endurance. Think ahead to the next move. Use your legs to hold your weight, not your arms. Use arms for balance and shifting weight, not holding weight. Watch your center of gravity. Use only the degree of strength on your grip as necessary to steady your balance. Keeping your body close to the wall keeps your center of balance over your center of mass, and relieves pressure on your grip. Challenge yourself on existing bouldering routes. Look for colored tape, and follow that same color to the top. The “V” towards the bottom marks the beginning of a route, and routes are based on the V-scale with MVO being the easiest and MV6+ being the hardest.